On April 14, 1865, while celebrating the end of The Civil War, one of our most beloved Presidents, Abraham Lincoln, was assassinated. At Ford's Theater, The President with his wife Mary was watching a play, entitled "Our American Cousin" when John Wilkes Booth entered the theater. As he neared the flag draped Presidential Box, some people thought he was a theater attendant until a shot rang out. Shortly thereafter the curtain came down, confusing everyone until they could see the President being carried from the box. The Lincoln Funeral Train left Washington DC on April 21, 1865 on a long sorrowful 1662 mile journey to Springfield, IL. The Train was retracing the route that Lincoln took going to Washington DC as President elect. On board the funeral car besides President Lincoln's body was the body of his son. Willie Lincoln dies at age 11 at the White House. His body was disinterred to be taken to Springfield, IL to be buried with his father. The Funeral Train usually only traveled between 5 and 20 miles per hour, and with stopping in almost every city and town they went through, it took nine days to reach Wanatah. It was said that Wanatah was not a scheduled stop. On May 1, 1865 at approximately 7:40 AM the nine car Funeral Train arrived in town. The conductor, seeing many mourners gathered, signaled the engineer to stop, letting the people quickly file through the car bearing Lincoln's coffin. The Train arrived in Springfield, IL on May 3 and the funeral was held on May 4. 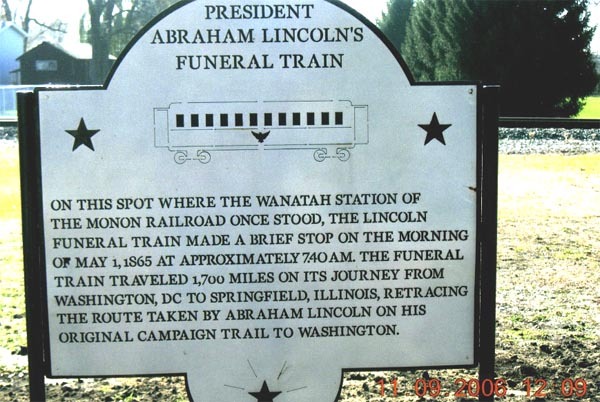 The Wanatah Historical Society has erected a monument honoring President Abraham Lincoln's Funeral train on the exact spot that the train stopped in 1865. The monument is located next to the Museum on the east end of Hunt's Park on Cross Street. President Theodore Roosevelt was also an early visitor of Wanatah. In spring of 1905, while returning from an extended hunting trip in Colorado, the Presidential Train made many stops and visits along the route back to Washington, DC. The President arrived in Chicago promptly at noon on Wednesday, May 12th. He was greeted by Governor Deneen, Mayor Dunne, Delegations from the Merchants, the Hamilton, and the Iroquois Clubs, a committee of Aldermen and other city officials. In Chicago, he was was the honored guest and speaker at several luncheons, meetings and receptions. On Friday, the 14th, he was expected to board his special train and travel through LaPorte, IN on his way to Washington, DC. Unknown to the people of LaPorte, he had his train switched to the tracks of the Pittsburgh, Fort Wayne and Chicago Railroad and headed toward Wanatah. The Social Club known as the Jolly Crokers, formed in 1903, had sent an invitation to President "Teddy" Roosevelt to attend a banquet in his honor in Wanatah, and he accepted stopping his special train here. The banquet was held at the palatial home of one of the members, and was attended by all those who were fortunate enough in holding tickets to the sumptuous affair. The President was in an unusually merry frame of mind and in responding to the toast "Mrs Stork", he expressed his deep gratitude for the honor conferred upon him and complimented the members of the Club on their high standard of ideals. He also wished them the success they so richly deserved. After kissing the babies, he shyly winked at the noble bird, which occupied a conspicuous place at the festive board, and bid them all a happy farewell. The special train carrying the President and party left the little city at 1:30 AM. Information regarding Pres. Roosevelt visit gleaned from The Daily Herald, LaPorte, IN, May 1905.